​Whether you dive with or without tanks, in saltwater or fresh water, breathing nitrox, trimix or holding your breath — Descent Mk1 is the intuitive, do-it-all dive computer you’ve been waiting for. It’s the first watch-sized dive computer to offer surface GPS with full-colour onscreen mapping and location reference — so you can easily mark your dive entry and exit points1. Once underwater, the proven Bühlmann ZHL-16c algorithm makes sure you’re staying within your dive limits. Selectable tone and vibration alerts help keep you informed while you’re submerged. Returning topside, Descent Mk1 also functions as a robust training companion, offering the best features of our fēnix® 5X ultimate multisport GPS watch, including smart notifications3 to help you stay in touch on the go. What’s more, the Descent Mk1 design is so sleek, comfortable and elegantly crafted, you’ll want to wear it as your everyday timepiece. Providing easy-to-access features for a range of diving activities — including the ability to plan dives on the device for recreational, technical and free diving — Descent Mk1 provides all the key, real-time data you need for a confident dive. The computer is automatically activated when you hit the water, showing your current depth, dive time, water temperature, ascent/descent rate, no-deco time, decompression stop information, battery life and more on the unit’s crisp 1.2” colour display. 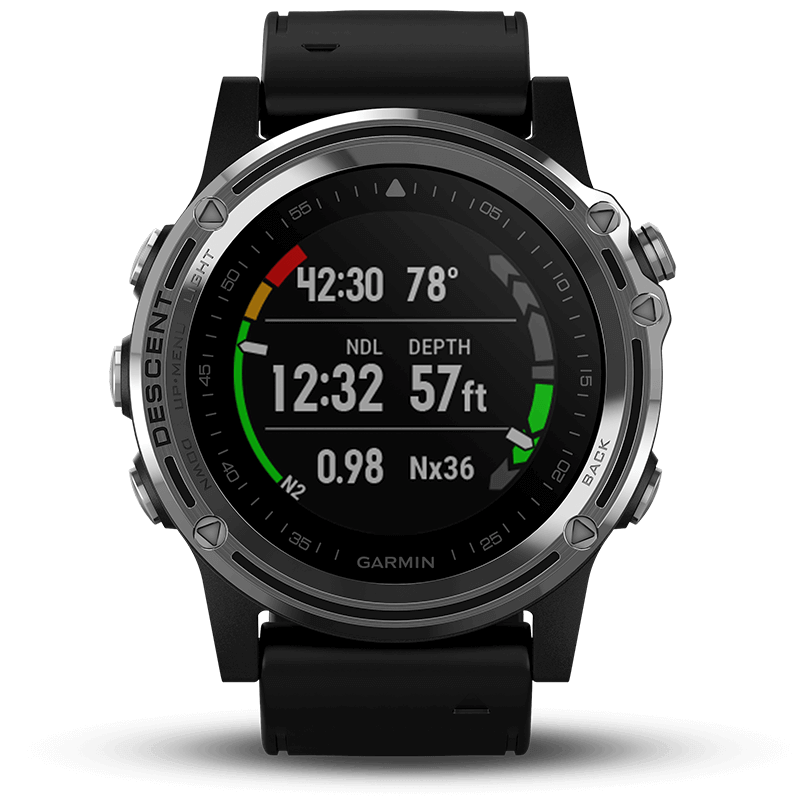 The Descent Mk1 dive computer uses Garmin Elevate wrist-based heart rate technology2 to optically scan your pulse (when worn in contact with your skin, not over a wetsuit or dry suit). The dive computer tracks your exertion levels and uploads your heart rate data automatically to your Garmin Connect online account for post-dive review and analysis. When paired with your compatible smartphone3, Descent Mk1 makes it easy to receive text messages, emails and smart notifications right on your watch face. It also gives you access to automatic uploads with Garmin Connect, audio prompts, music controls and more. While you’re topside, friends and family members can follow your location and adventures online, in real time, using the LiveTrack feature. Or you can use GroupTrack and your map display to keep tabs on your activity-sharing buddies as you go. Crafted of premium grade materials, the Descent Mk1 dive computer is available in two distinctive styles: a stainless-steel bezel with treated silicone watch band or a deluxe Titanium bezel version with brushed DLC Titanium bracelet. Both models offer advanced GPS and GLONASS satellite reception, via an EXO™ omnidirectional antenna in the bezel, for better reception in challenging environments (versus GPS alone). A bright, high-resolution, full-colour Garmin Chroma Display™ with LED backlighting assures great readability in all lighting conditions, above or below the water. And for added scratch resistance, both models incorporate a high-strength domed sapphire lens. Between charges, you can count on up to 40 hours of battery life in dive mode, up to 21 days in watch mode, up to 12 days in smartwatch mode and up to 20 hours in GPS mode (all depending on settings). QuickFit™ bands let you tailor your wrist-worn style for any daily activity or special occasion — no tools required. And for diving, longer QuickFit straps are included for use over thick wetsuits or dry suits. 5Wi-Fi is a registered trademark of the Wi-Fi Alliance.